"We need volunteers!" "Will you be my witness?" "Will you help organise the primaries in London?" Those kinds of comments have been arriving in my inbox for a while now. Having organised and set up my share of Venezuela-related, political events in London in the past, everyone sort of expects that this time too I would be involved in organising things. Though I am not. While my fellow Venezuelan bloggers have all gone into publishing who will they vote for, and why, I will rather say that I am not going to vote, not on Sunday, not come October, and I shall explain why Sunday's primary will not be the watershed moment every one is "predicting". No amount of wishful thinking and closed-door politicking will defeat Venezuela's best, wealthiest, and most powerful politico. There's no point, IMO, of beating around the bush on this one. Regardless of whether on Sunday the opposition candidate gets 1.5, 2.5, 3.5 or 5 million votes, Chavez will win, again, in October. It is utter nonsense, IMO, to even consider that the opposition stands a chance come the presidential race -unless the caudillo dies in the interim- while the electoral power continues to be but Hugo Chavez's Election's Ministry. The opposition, old and new, is doomed. It is pretty difficult for me, to get all worked up for Henrique Capriles Radonski, when very close relatives of his are up to their ears in gargantuan corruption rackets and, effectively, run Chavez's most efficient propaganda outlets. And wasting time talking about whether they are center-left, or center-right, or whether they are like Lula or Uribe, is pointless. They should be planning instead how to man every last polling station in the country, especially those in rural Venezuela, where thousands of phantom voters keep giving Chavez 100% of the vote. They should be ensuring that whatever the CNE announces is a true reflection of the people's vote, and not an unaudited, cooked result of CNE-controlled Smartmatics that only a fool like Jimmy Carter would vouch for. Until that happens, none of them stands a chance, and to think otherwise is foolish. Lula isn't the icon figure they should be taking cues from, but rather Alejandro Toledo, the humble cholo who defeated, arguably, South America's first post modern dictator: Alberto Fujimori. LaPatilla.com has published an invoice sent by Williams F1 to PDVSA, on 12 September 2011, so that pay-driver Pastor Maldonado could continue with the team in 2012. The amount requested for 2012 is £29,400,000, payable to Williams Grand Prix Engineering Limited's Barclay's bank account no. 00968277, sort code 20-01-09. Details of Williams VAT registration no. (GB 100 1901 88) and company no. (1297497) included in the invoice are correct. According to Williams F1 profit & loss account made up to end 2010, the company had a turnover of some £91 millions, while reporting a profit of some £6 millions. Williams F1 carries losses of some £88 millions. Against these numbers, the £29.4 millions gotten from PDVSA seem like Williams F1 best deal ever, that's roughly a third of 2010's turnover right there. 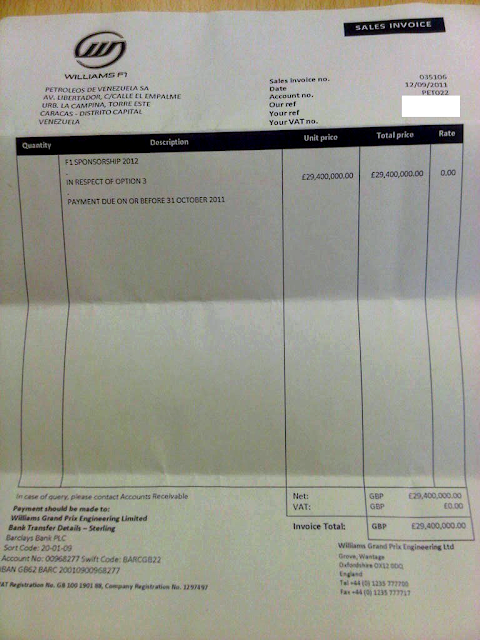 The amount shown in the invoice -payable for 2012- corresponds with the one detailed in the sponsorship contract between Williams F1 and PDVSA.